Like most Barbadian teenagers at the time, I loved the band Square One. Many of my girlfriends and I had a crush on its cute lead singer Anderson “Young Blood” Armstrong, while our male peers were infatuated with his gorgeous co-lead vocalist Alison Hinds. Square One was the epitome of energy, had wicked drum and bass lines, scintillating keyboard harmonies, tantalizing steel pan melodies and vocalists that commanded the stage and sent the audience in a frenzy. They were Bajans playing “our” music and had quickly become a national treasure, earning the moniker, “Soca Ambassadors”. One could imagine my excitement the year after buying their album, to meet in person members of Square One. The event was the “United Nations Global Conference on the Sustainable Development of Small Island Developing States” at the Barbados Community College. Square One had been invited to perform. 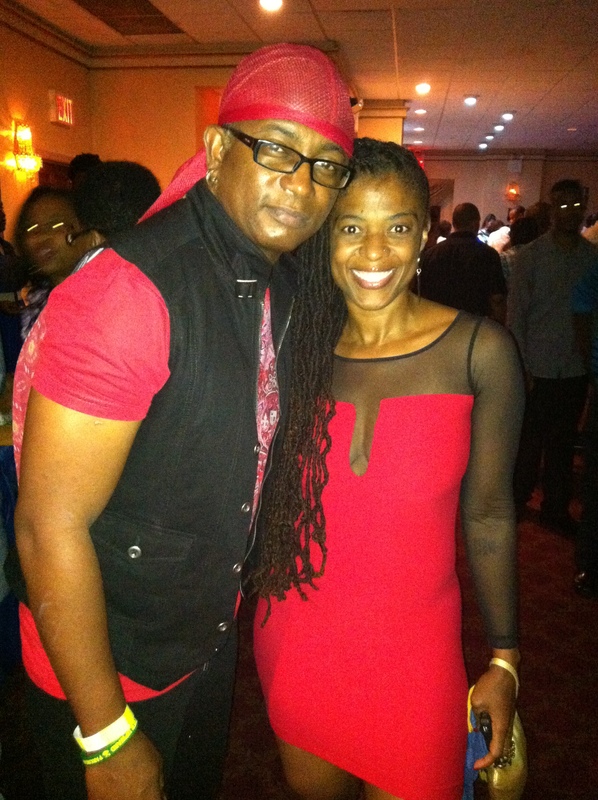 Me with lead singer of Krosfyah Edwin Yearwood at the George Jones benefit show in Brooklyn. I met the band backstage and from that day, started building relationships with: lead vocalists Anderson Armstrong, Alison Hinds and Cecil Riley; bass player Paul Slater; keyboard player George Jones; drummer Winston Beckles; and percussionist Terry “Mexican” Arthur. I’d eventually form valuable friendships with Terry, Andy and George. Some of my friends also became close to them and other members of the band and twice every week, we’d go and party to Square One at what was then the hot party venue in Barbados – Sandy Bank. I was such a regular that when Andy went to pick up or drop off Alison, to whom I lived nearby, he’d often give me a ride to or from home. When I became a reporter for the Barbados Advocate and later the Nation (Barbados), one of my primary beats was entertainment. Throughout my 10 years as a journalist before moving to New York, I covered countless performances by Square One from intimate audiences to major events at our national stadium, to Trinidad and Tobago’s Carnival, where they wowed tens of thousands of people. 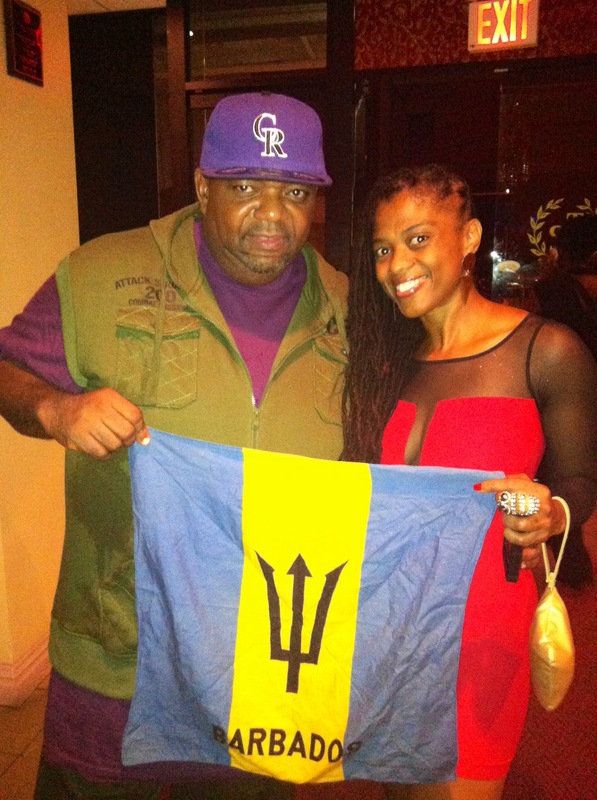 Square One promoted Barbados and our music all across the globe. Highlights of their career range from performing in South Africa to opening for the late great Ray Charles in Detroit to performing for the king and queen of Sweden. 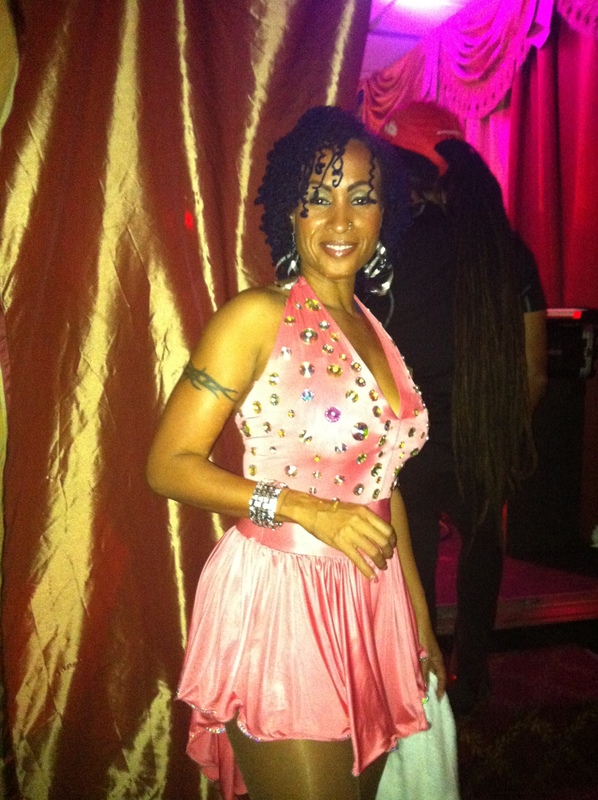 Soca Queen Alison Hinds about to perform in honor of her friend and former Square One band mate George Jones. Off the stage, I also witnessed the personal accomplishments of members as they became homeowners, got married and started families. It was when lead singer Alison Hinds followed suit and decided to leave the band to focus on being a mom, that Square One became defunct in 2004. By now, these guys were more than artistes to me and I more than a reporter to them. Be it over the phone with Terry, Andy, George or Paul, or in person, often joined by my friends Kathy-Ann, Verdel and Jennifer, we enjoyed endless engaging conversations, shared loads of laughter and overall, created many lasting memories. To me, Square One was family. As often happens when one emigrates, overtime, one loses contact with many friends back home. As I got caught up with starting life anew in Brooklyn, going back to college full-time for a second degree (a double major no less), and later on working while studying, it became harder to stay in touch with my people in Barbados. Being the only member of my family in the US also meant I had to work harder on trying to survive in this challenging City. So outside of my immediate family and dearest friends, I was lost as to what was going on with my wider friendship circle in Barbados. It was therefore a shock and heartache to me when in spring 2010, my friend Hazel called to say that George Jones, formerly of Square One, had been diagnosed with cancer of the colon and the worst was feared. My tears flowed over the phone as she filled me in on details, including that he too had migrated and was now living in the Cayman Islands with his new wife and family. My financial situation at the time rendered me helpless. I relied on all I had – my faith, and on hanging up the phone I fell to my knees and prayed for George’s healing. 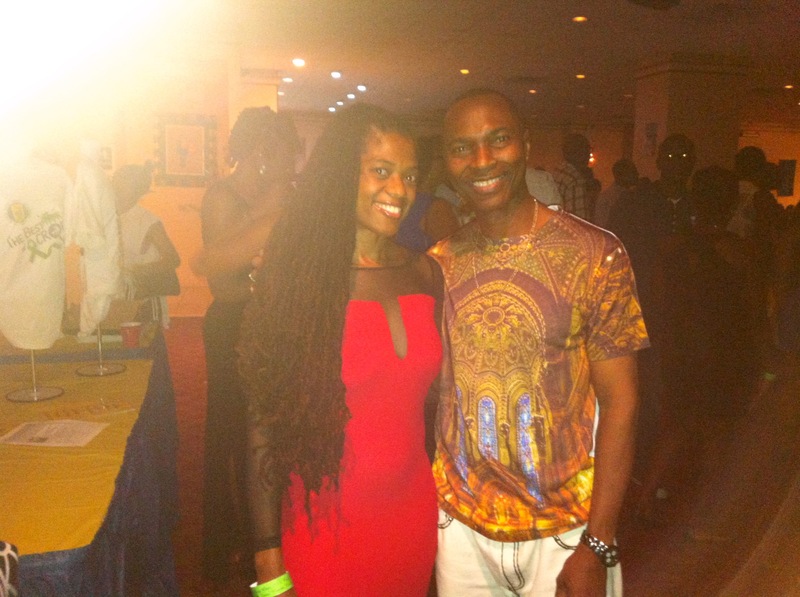 Me with former Square One musician George Jones of Barbados at the show held in his honor in Brooklyn. During Square One’s career, George had won the love and respect of not just fellow entertainers with his warm personality, musical skills, humility, candor and work ethic, but he’d also earned the admiration of Square One’s international fan base. He was the original bandleader before Andy took over, he was the one that kept all records of the band – newspaper clippings etc, he was Square One’s spokesperson. His illness touched all those who knew him. Barbadian musicians united for a fundraising event to assist with George’s cancer treatments, and everywhere people prayed for him to win this fight. George valiantly battled on. He endured some of the most painful months imaginable. His health remained in dire condition and finances kept dwindling. But George beat that cancer into remission. Still, the war was far from over; George’s kidneys had become damaged as a result of unchecked hypertension, which he’d had under control until the cancer treatment took its effects. He now had to change his diet to monitor the potassium, sodium and phosphorous content in his meals. Worst yet, he’d now be dependent on dialysis treatments and living in hope of that ever-elusive kidney donor. 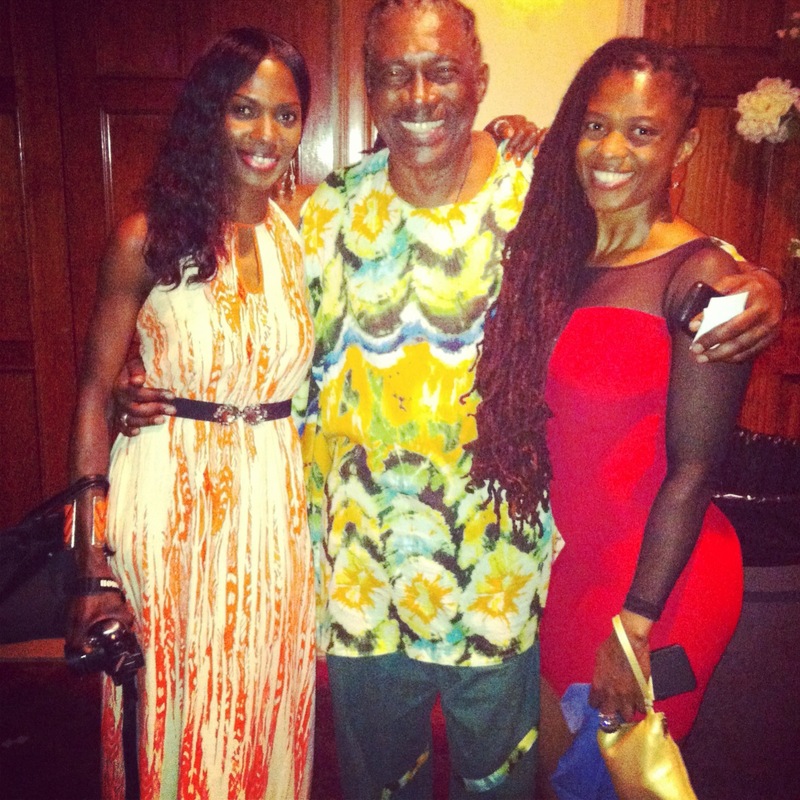 Me with Mighty Gabby and his daughter Julia Benn after his performance. Thus, when I heard of a benefit show for George scheduled for Sunday September 1, 2013 to be held in Brooklyn – a mere 10-minute drive from my home – I knew I had to be there, even though I retired eight years ago from the party scene. The event, dubbed, “The Best of Crop Over 2013” was going to feature the crème de la crème of Bajan Soca artistes: Stedson “Red Plastic Bag” Wiltshire (RPB), 10-time Calypso Monarch, former Tune-of-Crop (a.k.a. Road March) king and Sweet Soca Monarch of Barbados; Anthony “Mighty Gabby” Carter, Cultural Ambassador, eight-time Calypso Monarch and former Road March king; Edwin Yearwood, lead singer of one of the Caribbean top band’s Krosfyah, former triple-crown calypso king, several times’ Party Monarch and Road March king; former Square One lead singer “Queen of Soca” Alison Hinds and Andy “Blood” Armstrong – both individual Soca champions; Rupee, Atlantic Records’ artiste and former Road March king; Biggie Irie formerly of top local band Splashband; Mikey who shares all of this year’s Crop Over Soca titles with Blood as part of the band Soka Kartel; Peter Ram known for his hit “Woman By My Side”; Timmy of “Bumper Catch Afire” fame; and backing band Technics – Brooklyn-based Bajans. 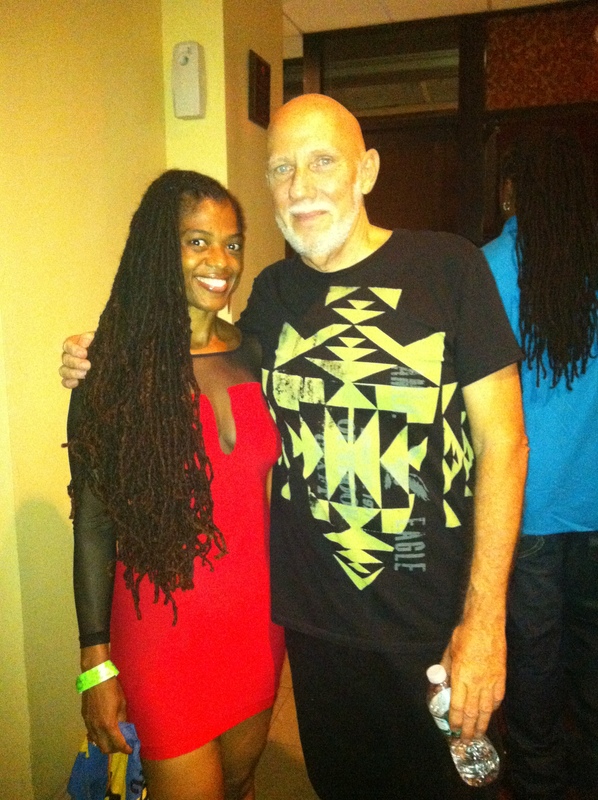 Me with Bajan musician and humanitarian John Roett, the man who organized the George Jones benefit show. Organizer John Roett, ace Barbadian musician and humanitarian said the idea for the show came about earlier this year when he was in the Grand Cayman and after (RPB) told him that George had expressed a desire for a kidney transplant. 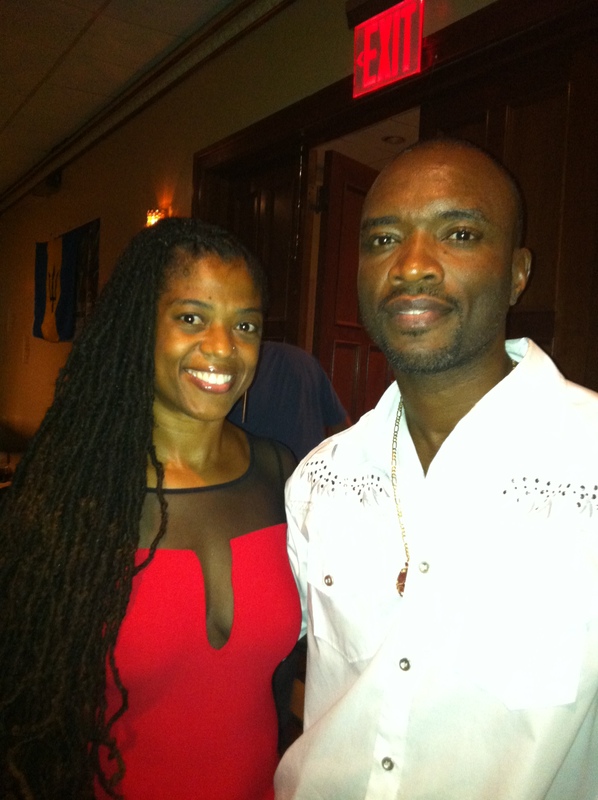 John took steps to round up the artistes, RPB contacted them with the idea of Labor Day weekend in New York, and their ally Mocha Browne got plans underway in Brooklyn. I watched as the weeks got closer to the show, saw more and more posters advertising it in my neighborhood, and several of my Bajan friends posted about it on Facebook. John even wrote on my Timeline that he hoped I was coming and inviting my NYC friends. My challenge was how I was going to make it happen, considering that as a freelance journalist, I’d struggled for assignments all summer and was barely making ends meet. I prayed that I’d get an email or call offering me a gig so that I could get a paycheck in time for the show. Me with my dear friend Merville at the George Jones benefit show in Brooklyn. With one week to go before the event, my hope started to wane, but then I got the most unexpected email. Right on time, I got an offer that enabled me to support this worthy cause. And so it was that I went last Sunday with my dear friend and fellow Bajan Merville in from Georgia and two others from here in NY – Barry, also Bajan and Sharon Guyanese, to Tropical Paradise Ballroom and Banquet Hall to help donate toward the George Jones Kidney Transplant Fund. The venue was packed and in no time electrified by the expert showmanship and sizzling hits from the repertoires of each class act. From the first performer Mighty Gabby to the “Queen of Soca”Alison Hinds who brought the curtain down, each Barbadian artiste did credit to our nation. It was simply a display of love, love for what they did, love for this hypnotic art form that is their livelihood, love for this music that unites so many, love for the patrons – predominantly patriotic Bajans soaking up the sweet Soca vibes. Most of all, it was a remarkable demonstration of love for their fellow entertainer, their brother, their friend George Jones. Organizer John told me that it was a simple task to get this stellar line up. “Just by asking,” he said. “Everyone was on board to give of their time and talent for free, without exception. We all saw the toll it’s taking on George as a cancer survivor, so there was never any question as to making it happen.” He said they had a few challenges with logistics and “competition” from the various shows going on in NYC for the Labor Day weekend, but given the full house, it was a successful event. John said they will continue efforts to meet George’s financial goals. Wells Fargo USA Chequing Account # 1010296887958. Absolutely splendid. One beat not missed. loved it. Loved it so much I shared it. Such sensitivity and clarity…we need a book from your unique perspective. Thank you for keeping it irie.